To say the University of South Carolina Women’s Soccer team has enjoyed a successful couple of seasons would be an understatement. The Gamecocks, led by 2016 SEC Coach of the Year Shelley Smith and her husband, Associate Head Coach Jamie Smith, have claimed back-to-back SEC regular season titles and reached the semi-final of the 2017 College Cup back in December. Since 2015, the Women’s team have utilized Firstbeat Sports to help them prepare for a busy schedule that sees them play out-of-conference games, compete in the SEC division and, as in recent years, the SEC tournament and NCAA postseason. We caught up with assistant Strength & Conditioning coach Alex Buchman to discuss how using Firstbeat technology has helped assess player fitness, improve recovery and boost performances on the field. Assistant Strength & Conditioning coach Alex Buchman. Firstbeat Sports allows coaches to individualize training based on personal physiology, using heart rate variability analysis to produce measurable metrics such as TRIMP (Training Impulse) and Training Effect. Being able to track each player over an entire season – from preseason through to College Cup semi final – means Buchman can provide valuable feedback to his colleagues about the status of the roster. “We talk after every session and go over the numbers. It’s important we establish a norm within the team and for each player, so we can properly plan out sessions. Having that data already solidified and understanding what we want to look at from a load standpoint has been really beneficial as I can better draw the picture out for the coaches,” he summarized. And the ability to analyze the data in real time means coaches can make actionable decisions. For example, reducing a certain player’s training minutes, the length of specific team drills, or removing a player from the session early to reduce the risk of injury. Having a coaching staff that has fully bought into using data to help inform training loads means a seamless process from seeing a metric on the dashboard to adapting the session itself. It isn’t just the coaching staff who are kept in the loop regarding the numbers. Buchman has seen a positive response from players, too, when explaining certain decisions regarding their training. This is particularly useful during the season when, rather than reducing training intensity, training minutes may be curtailed after a particularly intense fixture. “Ahead of time, I’ll send the coaches a list of players whose volume we may want to cut down. The players really buy into it as well. 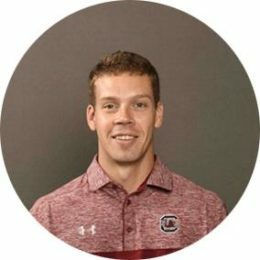 The Gamecocks staff are careful not to overload players with every metric they monitor. However, combining Firstbeat Sports data with their own daily wellness questionnaire, Buchman and his colleagues do use the analysis as a motivational tool to push for more from athletes when the data shows it is possible. “It’s not like they’re slacking in training, but we can tell them ‘You can bump it up another notch and I think you’ll benefit from that in your playing’. ‘There’s another level you can reach in your training because I am seeing that consistently in your data’. Buchman believes that data analytics is becoming more common in Women’s collegiate soccer and, as the league becomes increasingly competitive, he only sees the impact increasing. For him, Firstbeat Sports has provided the tools needed to help retain that competitive edge.